Wii U is the next great gaming console from Nintendo and it redefines how you will play next. With its innovative new Wii U GamePad controller, it will not only introduce entirely new ways to play games, it will also transform how you connect with friends and enjoy entertainment. 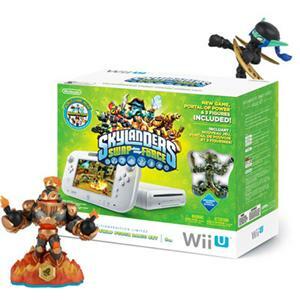 Nintendo Wii U 8GB Basic Skylanders SWAP Force Bundle includes: a white Wii U Basic system a Skylanders SWAP Force starter pack that includes: Skylanders SWAP Force Wii U software a Portal of Power Exclusive Color Washbuckler Blast Zone (SWAP Skylander) Ninja Stealth Elf (Core Skylander) Character Poster 3 Trading Cards 3 Sticker Sheets a Nintendo Land game disc About Skylanders SWAP Force The third installment of the award winning toys to life Skylanders franchise, Skylanders SWAP Force lets players mix and match the top and bottom halves of up to 16 SWAP Force figures that are available for purchase and transform them into more than 250 unique characters . Fans also can play Skylanders SWAP Force with their entire collection of 100+ characters from Skylanders Spyro’s Adventure and Skylanders Giants. The Wii U version of the game stands apart, with touch screen interfaces on the Wii U GamePad controller and the ability to play the entire game on the GamePad while someone else watches TV.